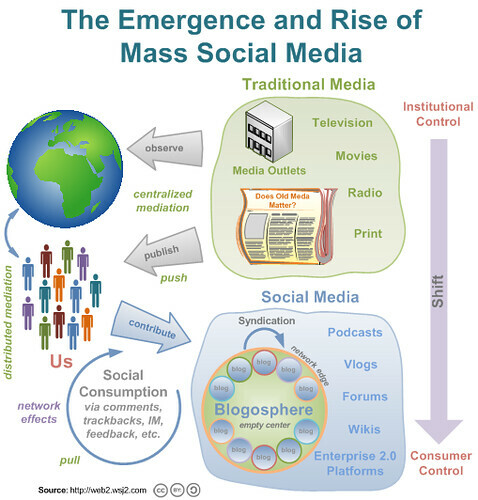 The Emergence and Rise of Mass Social Media originally uploaded by JASElabs. In yesterday's post Bathroom Blogfest 2009: Ready To Flush Recession & Plunge Into Forgotten Spaces, I promised a recap of Liane Evans at the MarketingProfs Digital Marketing Mixer in Chicago addressing "Blending Social Media and Search: Marketing for a Greater Impact: Understanding it's about being found." Liana "Li" Evans is director of social media with Serengeti Communications. She exudes intense passion for social media and search combined with deep knowledge and her session put into practical perspective how to market for greater impact. Something we all need, right? The premise that immediately resonated with me was being found online. It's something I'm reminded of each day and preach intensely to those around me. Truly, it's not about pushing or forcing irrelevant messages that don't engage end users. Now, the combination of social with search creates opportunities to interact, have conversations, and share perspectives with and generally create relevant meaning for customers. Think about it, social media represents conversation + strong elements of customer service and public relations; it's focused on longterm relationship building [e.g., Zappos gets 75% of new customers via social word of mouth]. But search isn't limited to just search engines. YouTube, for example, is the 2nd most important source of searches and Craigslist, MySpace and Facebook matter, too. At the same time, marketers should realize that the Breakup has happened. Our end user customers determine what's important, not us. Rather than trust a brand's description of benefits, they form their appreciation based on what they glean from their social network. Relevance to them and their lives matters. Brands that listen and observe what's going on have a chance to take part in the relevance. They can even create relevance by participating in social media tools like blogs - which are valuable archives for permanent, searchable and resuable content [vs. say a telephone script or call that gets repeated ad infinitum] - and being open to interaction. That's where SEO plays a fundamental role, ensuring that blog post title tags, digital assets and content are optimized, that they are tagged and the content categorized. Now, getting back to being found online. Understanding - and listening to - your customers and audience is absolutely KEY! That means understanding how they search, what language they use and how they prefer to consume content? Critical questions. Basic ones, too. As Li asked us, if a potential customer searches for 'toilet' and all of your content has been written from the perspective of 'commode,' what are your chances for being found? Our terms, acronyms and industry lingo are meaningless. Customers will search for what they need using their language. Don't you think it would be valuable to be found when they do so? Finally, remember that your audience decides what is valuable, not you. Your content should be portable and easy to share [which makes it easy to find, too!]. Don't be stingy: link to others, say thank you and spread the love and remember it isn't all about you: other people make it easy to find you as much as a search engine does. Additional advice: learn to write; be sure to listen and don't delegate social media to interns; they just don't know and can't speak to customers for you.